How Does Your Church See Kids? Interruption or Important? You've probably seen the recent newscast where Professor Robert Kelly is being interviewed live on BBC News about South Korea, when suddenly his kids enter the room and interrupt the interview. It provided a comical moment as Robert tried to keep his composure and complete the interview successfully. This reminded me of the story in Matthew 10, where some parents brought their children to see Jesus. The disciples saw the children as an interruption and told the parents to take them away. But not Jesus, He saw the children as important and stopped everything to minister to them. Sadly, many churches seem to have a wrong view about children just as the disciples did. 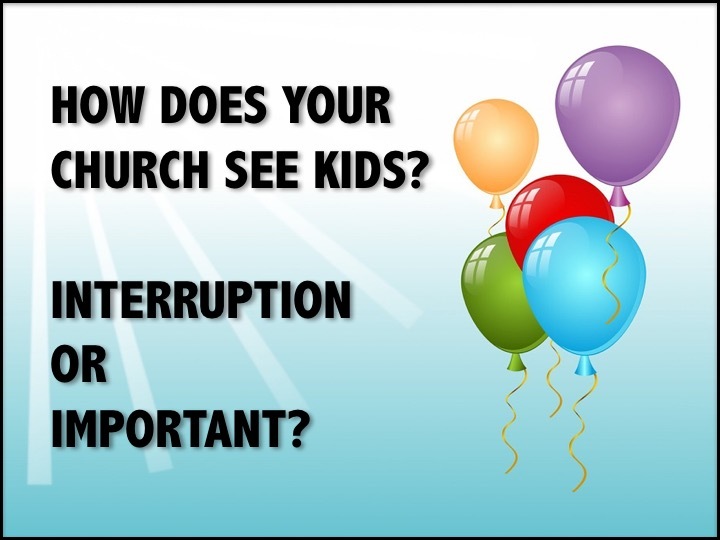 They see children as an interruption rather than as important. They might give lip service to children's ministry, but actions speak louder than words. Their budget, building, staffing, programming and volunteers say that children are not important. This is a mistake, because when you make children's ministry a priority in your church, you align with how Jesus sees them and usher in God's blessings upon your ministry. In a recent seminar, Ricardo Miller and I shared how to make children's ministry a priority in your church. It's a great resource to share with your leadership if you want to see children's ministry become important in your church. The recording of the seminar is available at this link. Let's see kids as Jesus did. Important.